"This is my Grandmother's recipe, at least 50 years old, a classic cherry almond icebox cookie that I turned into a bar cookie. I also dip or drizzle white chocolate on the cooled cookies to make them a little more fancy for Christmas cookie exchanges. But it's delicious either way!" Preheat oven to 350 degrees F (175 degrees C). Line bottom and sides of an 11x7-inch glass baking pan with parchment paper; leave paper hanging over pan edges so that cookies can be lifted out after baking. Beat butter and brown sugar together with an electric mixer until light and fluffy, about 2 minutes. Stir flour into butter mixture until crumbly; stir in almonds and cherries. Press mixture evenly into the bottom of prepared pan. Bake in the preheated oven until lightly golden at edges, about 20 minutes. Score with a sharp knife into bars while in the pan and still warm; allow cookies to cool about 30 minutes. Lift cookies from pan and slice to separate along scored marks. Melt white chocolate in a microwave-safe glass or ceramic bowl in 30-second intervals, stirring after each melting, for 1 to 3 minutes (depending on your microwave). Do not overheat or chocolate will scorch. 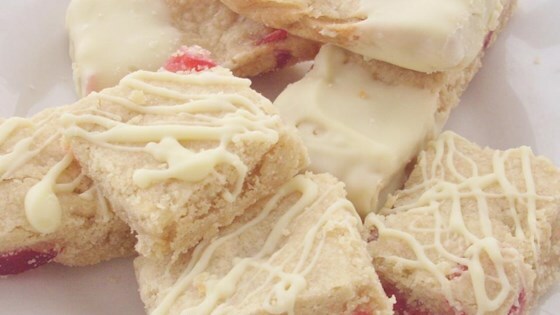 Drizzle melted white chocolate over cookies or dip half of each cookie into melted white chocolate. My grandmother's original recipe called to divide the dough into two logs, roll in plastic wrap, and refrigerate until firm. Slice into 1/4-inch coins; bake at 350 degrees F for 15 minutes. Or roll into 1-inch balls, press down lightly and bake at 350 degrees F for 15 minutes. Look for all-natural glace cherries, without food dye, if you prefer. Or plump up dried tart cherries in hot water for 10 minutes, dry and add 1/4 teaspoon of almond extract to the dough. Store cookies in an airtight container at room temperature or in refrigerator for up to 3 weeks; store in freezer for up to 6 months. I made these the traditional ice box cookie way and they turned out very well. As I dislike white chocolate I m sorry to say I used very dark chocolate...delicious!!! The recipe calls for way too much butter. I will not make these again.